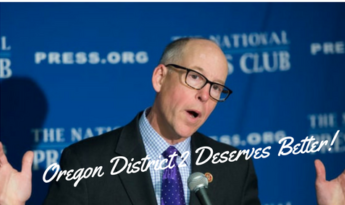 We have it on good authority that the person elected to the U.S. House of Representatives for our congressional district, the sneaky Greg Walden, will be at the Mail Tribune on Monday, October 22 at 10 a.m. for an interview. He is hoping to slide in as he always does, under the cloak of secrecy. It’s been since April of 2017 that he has met with us. Please show up at the Mail Tribune, 111 N. Fir Street in Medford by 9:30 a.m. on Monday. Bring your family, friends, neighbors, flags, signs and messages. People who show up in a chicken suit will get a free ORD2 Indivisible t-shirt of their choice! Let’s remind him that he has to answer to all of us!